For three decades the signature “W. C. Hook” has connoted dynamic design, saturated color, and muscular brushwork. William Cather Hook’s ability to straddle the border between pictorial illusion and pure paint, between traditional yet modern, has won him collectors worldwide. Less well-known about this master of acrylics is the breadth of his subject matter. 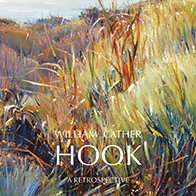 In this retrospective of paintings dating from the early 1980s to the present Hook guides the reader on a journey that includes the back roads of northern New Mexico, the high country of the Colorado Rockies and Sangre de Cristos, California’s Pacific coastline and central valley, the reaches of the Sonoran Desert, and historic vistas in England and Italy. Whether depicting crashing surf, aspen forests, or luminous big skies, Hook’s vision is inviting, vibrant, and infused with radiant light. Also explored is the artist’s biography, from his Kansas roots to his current studios in Santa Fe, New Mexico, and Carmel, California. Susan Hallsten McGarry was the editor-in-chief of Southwest Art from 1979 to 1997 and is currently the director of the Plein-Air Painters of America. M. Stephen Doherty is an artist, the past editor of American Artist, and the current editor of PleinAir magazine.